A man who wrestled away a woman’s phone in the 700 block of North Rush this spring has been sentenced to two years in prison. Latroy Wiley, 31, pleaded guilty to one count of robbery in a plea deal approved by Judge Dennis Porter. Around 6:30 p.m. on May 1st, Wiley wrenched the 23-year-old woman’s phone away and ran into the Chicago Red Line station. Several witnesses who were dining at a nearby Giordano’s provided cops with a detailed description of the robber. Officers in the Loop arrested Wiley as his train pulled into the Jackson station. John Peralta, 21, has pleaded guilty to committing two separate robberies in the Loop last winter. Judge Timothy Joyce sentenced him to two concurrent eight-year terms. The crimes were categorized “Class X,” the state’s second-most serious level, so Peralta is required to serve at least 85% of his sentence before being eligible for parole. On the afternoon of January 7th, Peralta pulled out a gun and demanded money from a 21-year-old man on a CTA train downtown. 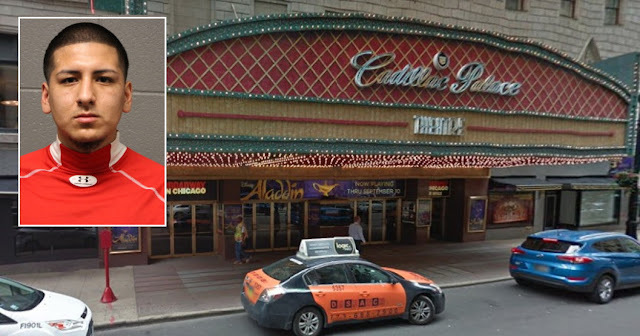 Peralta exited the train at the Washington-Wells station and walked about a block to the rear entrance of the nearby Cadillac Palace Theatre where he robbed another man at gunpoint. Peralta ran from the scene and managed to drop his gun in the middle of LaSalle Street directly in front of police officers who were responding to the robbery calls. He was arrested immediately. The gun turned out to be a starter pistol. 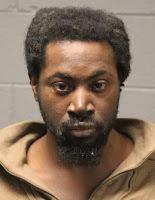 In a non-robbery case: Marlon Miller, who broke an Uptown man’s jaw in two places during a random attack outside of Block 37 on February 26th, has been sentenced to two-years of mental health probation plus 180 days in Cook County Jail by Judge Charles Burns. Miller pleaded guilty to one count of aggravated battery in the plea deal. Miller, 32, attacked the man entirely at random and without provocation in the middle of the afternoon, prosecutors said. The victim, 40, was treated at Northwestern Memorial Hospital for a swollen face, bleeding, and a fractured jaw. At the time of the incident, Miller listed a West Loop shelter as his home. He has an extensive criminal history in Iowa but no previous arrests in Cook County.